John Stott wrote that a preacher is a bridge builder. That is, in the act of preaching, the preacher is seeking to build a bridge between the world of the Bible and the world of the listeners. A good biblical message will be solidly earthed in the biblical text, but it must also fully embrace the listeners in their world. Effective communication requires that we know about those who are listening to our message. However, the preacher is not a politician, nor a salesperson. The preacher is a shepherd of souls. God invites us not only to know the listeners, but to really love them. 1. We love, because God first loved us. We cannot self-generate love for God or for other people. Love is a response to the love God has first poured out for us. As we fix our gaze on Him, our hearts will begin to beat with His. He loves our listeners, so we can too. 2. A lack of love for others indicates a problem. We can’t claim to love God, but not love our brother. Let coldness toward others stir you to ask God to search your heart. Take coldness seriously, God does. 3. Loving those we pastor is sometimes challenging. Loving strangers is a challenge for a visiting speaker. Loving people you shepherd can be harder. Vulnerable sheep can bite. 4. We can connect because we are not in a separate category. Maintaining a permanently stoic resolve does not make you a great leader, it makes you a distant one. You experience many of the same challenges and struggles others face. Be honest with yourself about what you do face, and what you don’t. 5. Diligently study your people. Don’t be a master exegete of the text, but oblivious to your people. 6. Before you talk in the pulpit, listen carefully. Most people don’t necessarily want to be seen, but they long to be heard. 7. Sharing life experience helps massively. Remaining distant is easy, but harmful. Have folks over, visit them at home or at work. Share sport, share celebrations, share sorrow, share life. 8. Pray for people. It’s easy to pray a “God please bless all the listeners on Sunday” kind of prayer. I think God can spot the value you place on people by the prayers you pray for them. 9. 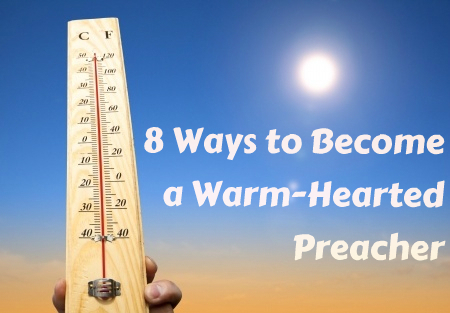 Associate with warm-hearted preachers — those you listen to, those you read, those whose counsel you seek. 10. Pray that God will teach you to love AND to let people see / hear your love. This is a work of the Spirit, not a human endeavour. We can fake it, but if it is to be real, God is going to have to do it in us.